Sri Sri Sri Maha Periyava’s Aaradhanai falls on January 1, 2019. 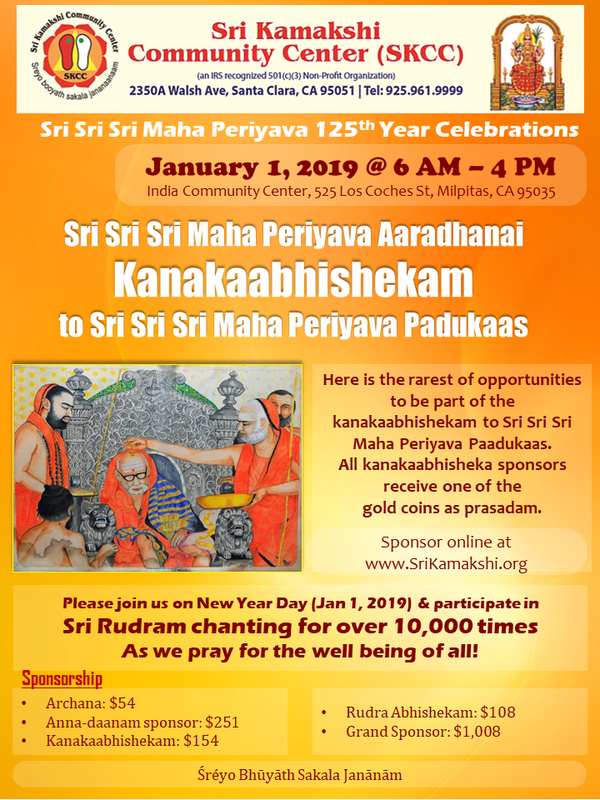 In keeping with the tradition of following the teachings of Maha Periyava, Brahmasri Chandramouli Narayanasastrigal and SKCC have planned “Sri Sri Sri Maha Periyava Aaradhana-Mahotsavam” – a GRAND and devotion-filled way to start the New Year 2019 with a unique event where we have 10,000+ times chanting of Sri Rudram. Register NOW as a Ruthvik / volunteer for this one of a kind event. Being the 25th year of Maha Periyava’s Aaradhanai and also his 125th Jayanthi celebrations year, SKCC plans to perform Kanakabhishekam for Sri Sri Maha Periyava. Here is the rarest of opportunities to be part of the kanakaabhishekam to Sri Sri Sri Maha Periyava Paadukaas.